It's all here. Everything from potato peelers to sleeper sofas. Ready to make your house a home. We're a bunch of people who love to cook, entertain and make our homes look great. The products you'll find here are the things we use and love ourselves. We think you'll like them, too. Guess what? After 33 years at the same spot, we've moved our NW 23rd Ave. store. 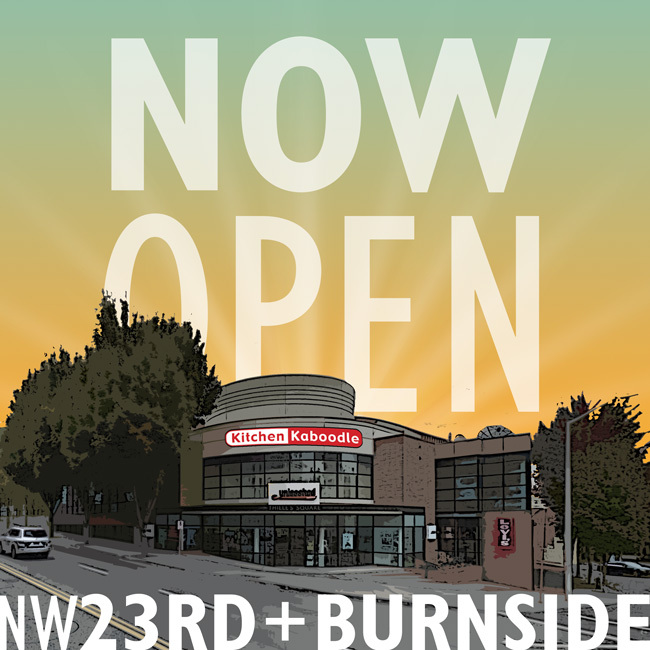 We're just 2 blocks south on 23rd, at the corner of 23rd & Burnside, where Cost Plus used to be, on the upper level, across Burnside from Zupan's. It's only 537 feet away from our old store, according to Google. We have all the same great stuff, with everything on one floor, and with more parking. PS...don't look for the sign in the picture, it's not actually installed yet. But, it will be soon! Get It Right! makes the ultimate in silicone kitchen tools. They make the finest silicone straws, too, complete with a cleaning squeegee and a carrying case. See all the styles here. 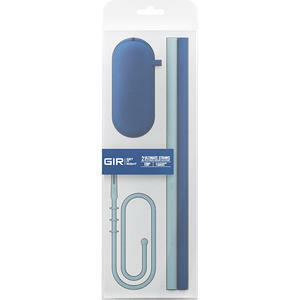 Toss these 8.25"-long straws in your bag, not in the ocean: they come with a compact traveling case that fits folded up straws. The ultimate reusable, eco-friendly alternative to disposable plastic straws, they're made from the same high-grade silicone as Get It Right! 's kitchen tools. They?re taste-free, odor-resistant, and unlike metal straws, can handle hot coffee or iced tea while staying the same comfortable temperature on the outside. Plus, they come with a pull-through cleaning squeegee for a squeaky clean straw after each use. Since 1975, Kitchen Kaboodle has been Portland’s go-to store for people looking to make their house a home. 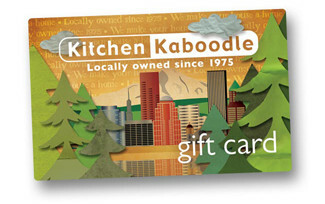 Kaboodle has been honored as one of the nation’s top 25 kitchen stores of the last 25 years. And we’ve been the US nominee for the international GIA award. But, we’re more than simply a kitchen store. Sure, you’ll find an unsurpassed selection of the finest cookware, bakeware, cutlery, tools & gadgets, kitchen appliances, and much more, all carefully selected by our skeptical buyers. And you’ll enjoy a glittering collection of dinnerware, table linens, glassware, and decorative accessories. But, we’re also proud of one of the most distinctive selections of furniture you can find anywhere, including sofas, sleepers, and recliners; dining tables & chairs, barstools and buffets; occasional tables, lamps and lots of rugs. Don’t live in the Portland area? Give our stores a call, toll-free, at 800-366-0161. You're now a Kaboodle Insider. Thanks for joining! A confirmation email is on its way to you and should arrive shortly. Just a thought: to ensure proper delivery of your weekly Hot Sheet, take a moment now and add us - insider@kitchenkaboodle.com - to your address book, trusted sender list, or company white list.
. I want to join all those other Kaboodle Insiders and get first notice of new products, markdowns & events and Kaboodle Insider-only special offers. so enter me as a January February March April May June July August September October November December baby! All we need is your name, e-mail address and birthday month. To save paper, trees, and other resources, we’ll contact you exclusively via e-mail. We never, ever sell, lend, donate, give, or in any way make available any of your contact information to anybody, for any reason. We could probably make some money doing that, but we figure you hate getting unwanted e-mail as much as we do, so we don't.